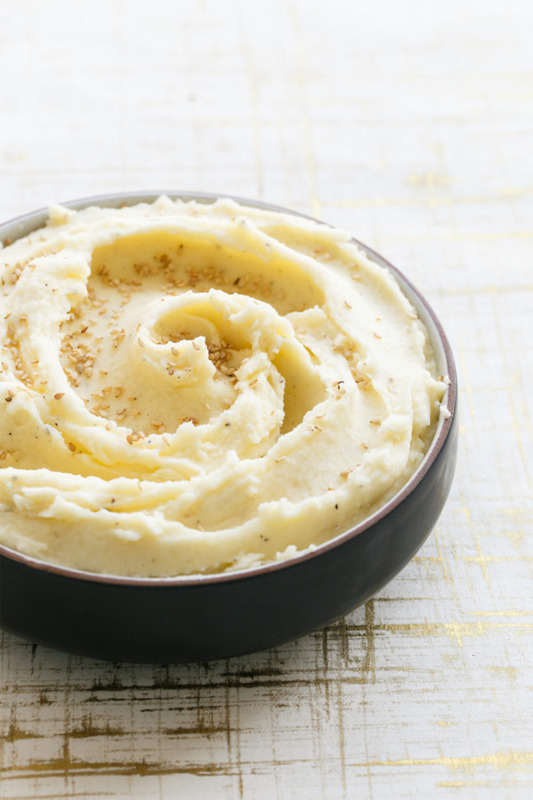 Every year, for Thanksgiving, I try to do a little something “different” with my mashed potatoes… without disturbing the fragile equilibrium that exists between those who enjoy a traditional Thanksgiving feast (my husband) and those who like to try new things every year (me). Basically, I try to satisfy his traditional tastes while still having a new recipe to post here on the blog. Traditional with a twist, if you will. This recipe would be especially great if you are going for a slight Asian flavor with your Thanksgiving menu. You know, a soy-sauce brined turkey, miso-almond green beans, ginger sake cranberry sauce… these potatoes will fit right in. 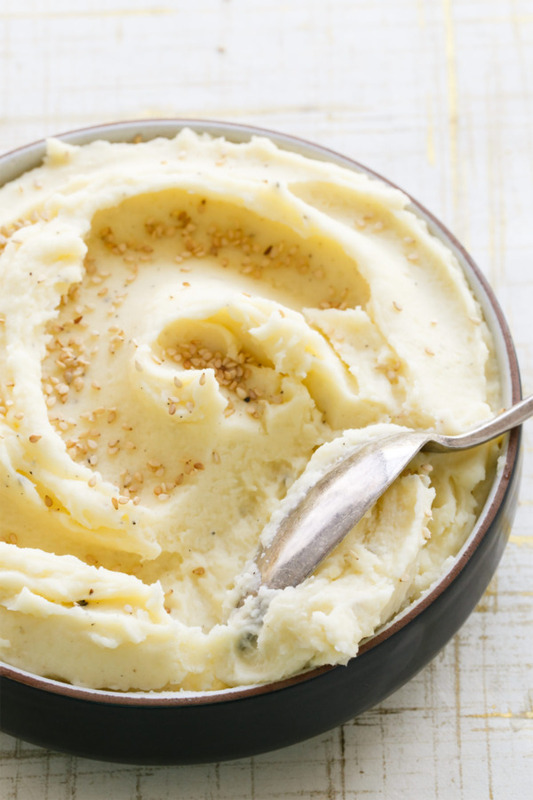 My new favorite method to make mashed potatoes is using a food mill. It takes a bit longer to process the potatoes and clean up, but, get this, you don’t even have to peel your potatoes, as the food mill will remove the skins for you after the potatoes have boiled. This is a game changer, people! See, canning has taught me more than just how to make jam. 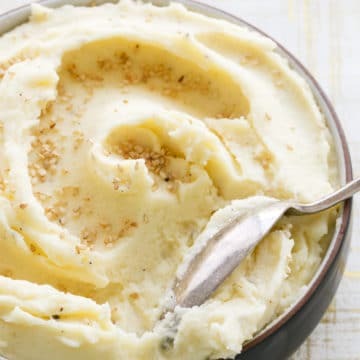 Make ahead tip: you can cut and prepare your raw potatoes at least 2-3 hours ahead of time, then store the cut pieces in a bowl covered with salted ice water. The water will keep them from oxidizing (turning brown) and the salt will actually tenderize and infuse the potatoes with seasoning from the inside out. 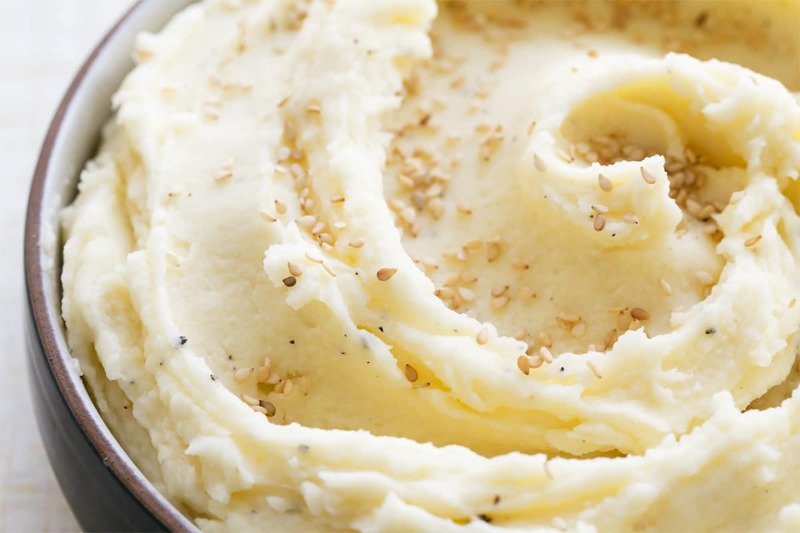 In fact, I’ve seen mashed potato recipes where you refrigerate the cut potatoes overnight in salt water, so really, you could get this prep work out of the way well in advance of the big meal. Then, 30 minutes or so before the turkey is ready to eat (about 10 minutes before it comes out of the oven), boil and mash your potatoes so they are hot and ready when you are. 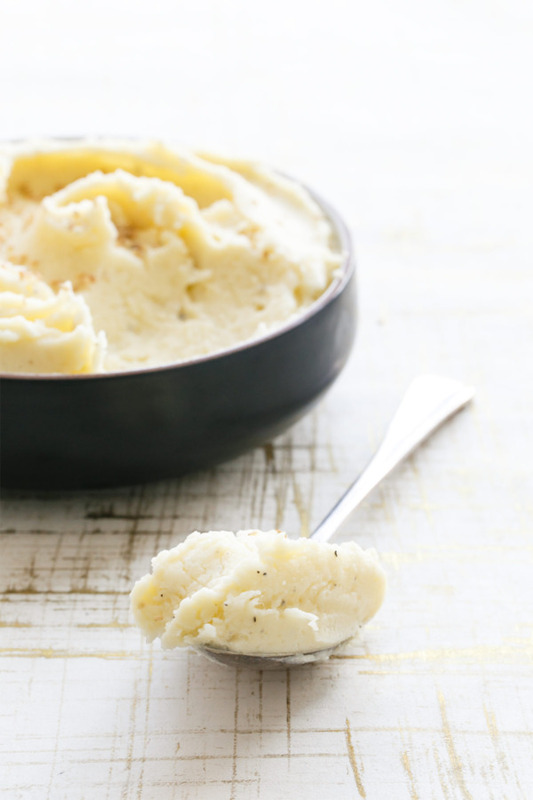 Fluffy, creamy mashed potatoes with toasted sesame oil for a hint of Asian flavor. Scrub potatoes well to remove any dirt, then peel (unless you are using a food mill to process, in which case you do not need to peel your potatoes). Cut potatoes into quarters or eighths, depending on the size. You want approximately 1-inch size pieces (all fairly even in size so they will cook uniformly) and transfer to a bowl filled with cold salted water. 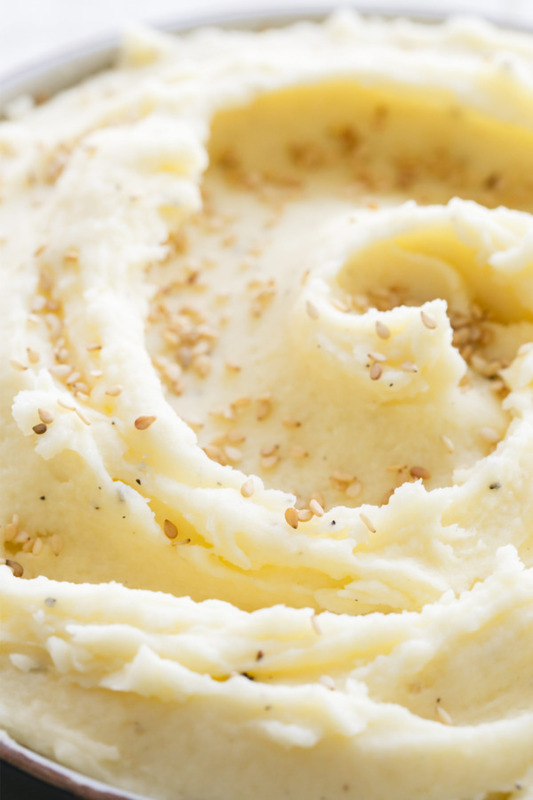 You can prep and cut your potatoes a few hours ahead of time if necessary; keep covered in water to prevent browning. Boil potatoes in a large pot of generously salted water for about 15 mintues minutes or until fork tender (a fork inserted into a piece of potato should go in easily and the potato should somewhat break apart). Drain well. Run potatoes through a food mill placed on top of your still warm cooking pot on the still warm burner. The residual heat from the pot will evaporate out any excess moisture from the potatoes. 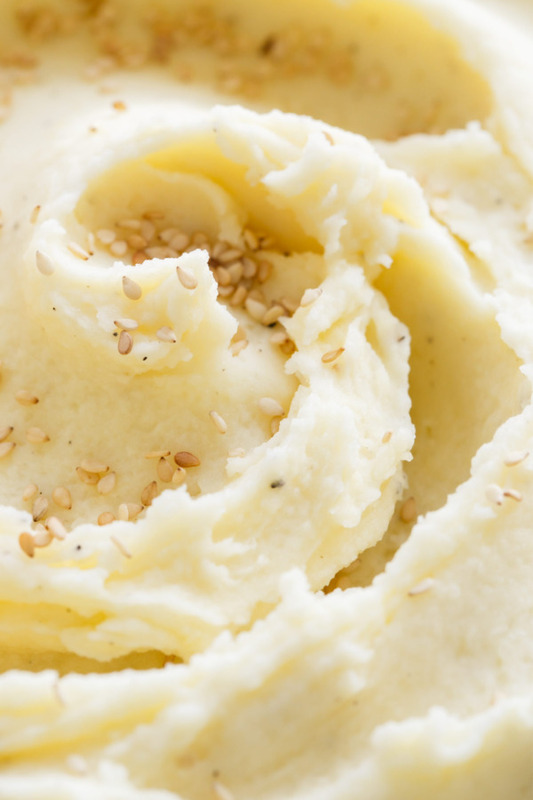 If you don’t have a food mill, run potatoes through a potato ricer, or place in the pot and mash with a potato masher until smooth. Add butter and stir until melted, then add heavy cream and sesame oil. Season generously with salt and pepper. Serve warm, topped with a sprinkle of toasted sesame seeds if desired.